There will be a screening of the independent documentary "Barnstorming" at the Little Art next Saturday, March 12 at 4 pm. 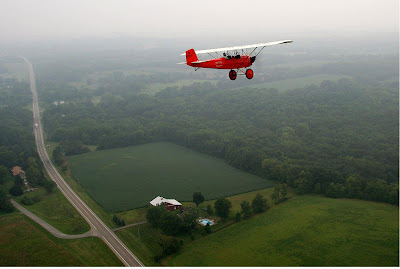 The film is the story of a group of pilots who fly from Ohio (after meeting up at Jim Hammond's aerodrome in Yellow Springs) and fly to the same Indiana dairy farm hayfield every year. It's a tradition that grew out of a chance encounter 11 years ago and has created a real-life field of dreams. "We shot a good part of the film in Yellow Springs, and Jim is featured prominently," co-producer Paul Glenshaw told the Blog via email. "Although we screened the rough cut in 2009 at the Reel Stuff Aviation Film Festival in Dayton, this will be the first screening of the finished film at a theater there in Yellow Springs. Our ties are all the stronger to the area since the film is now being broadcast nationwide on PBS, with ThinkTV as our presenting station." That looks like US68 and Jacoby Road to me.